Official artwork of the Wolfen from Star Fox: Assault. The Wolfen (ウルフェン, Wolfen) is the name of the ship piloted by Wolf O'Donnell and his team, Star Wolf. They are similar to team Star Fox's Arwings. Wolfen as it appears in Super Smash Bros. The Wolfen occasionally flies by in the background of Sector Z, but does not attack the player. Wolfen as it appears in Melee. A Wolfen appears in the Corneria and Venom stages, occasionally firing lasers at the characters on-screen. The Wolfen doesn't target any character in particular. In the Corneria stage, once it has stopped firing, the Wolfen will then fly off the screen after a few seconds. If a character remains on it when it flies off the screen, that character will receive a Star KO. It also appears in the opening movie, piloted by Wolf as he makes his cameo. The Wolfen trophy is obtained by clearing Adventure Mode in under 18 minutes 20 seconds or less. Wolf's on-screen appearance in Brawl. The Wolfen reappears in the Corneria stage as it did before and also makes an appearance in the Lylat Cruise stage. It appears briefly in both Wolf's on-screen appearance in which he ejects from it to enter on the battlefield, as well as a bonus scene of the Subspace Emissary, in which Wolf ejects from the Wolfen and lands on the Lylat Cruise to face off the player. It's also notable that the Wolfen appears slightly different than the Star Fox: Assault version, where its wings are spread farther apart. The Wolfen also appears as a sticker in Brawl. 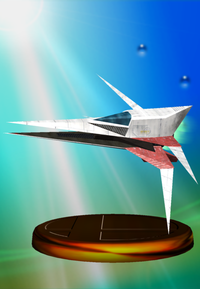 A class of starfighter piloted by Team Star Fox's rivals, team Star Wolf. Wolfen's boast more gravity-suppressing plates than Arwings, making their performance equal or perhaps even superior. When Team Star Wolf reappeared, they were piloting Wolfen II ships--improved versions with two laser cannons rather than one and capable of reflecting attacks by rolling. The Wolfen appear as a distinct trophy. Also, the Wolfen reappears in the Corneria stage. Wolfen trophy in Super Smash Bros. for Nintendo 3DS. Star Wolf's all-range fighters were designed by an evil scientist (Andross) and a truly shameless mechanic (Pigma). Still, leaving aside the designers' personal qualities, the Wolfen's performance and careful design make it truly stand out. In fact, its turning ability and high-gravity resistance surpass even the Arwing. A Wolfen (top) as seen during a match between Cloud and Link. The Wolfen appear as a distinct trophy. Its Assault version is an item in Smash Tour: when used, it makes a selected opponent start the battle with 100% damage. Also, the Wolfen reappears in the Lylat Cruise stage. Wolfen (Assault) trophy in Super Smash Bros. for Wii U. These all-range fighter are Star Wolf's pride and joy. They're considered to be on the same level as Star Fox's Arwings-maybe even better because of having two pairs of Gravity Blades. In Star Fox: Assault, you can actually earn a chance to fly a Wolfen yourself. Why not try out and see which is better? These all-range fighter are Star Wolf's pride and joy. They're considered to be on the same level as Star Fox's Arwings - maybe even better due to having two pairs of gravity-regulating Gravity Blades. In Star Fox: Assault, you can actually earn a chance to fly a Wolfen yourself. Why not try out and see which is better? The Wolfen as part of Wolf's Final Smash. Wolf returns as a playable character in Ultimate, and once again his on-screen appearance involves jumping out of his Wolfen. His new Final Smash, Team Star Wolf, involves him and the rest of Star Wolf firing on opponents from their Wolfens. This page was last edited on March 19, 2019, at 08:18.